Thomas J. Erker | Erker Law Firm, P.A. Thomas J. Erker is known as an aggressive, effective, and professional trial attorney who fights for his clients’ interests through persistent advocacy in Kansas Courts. 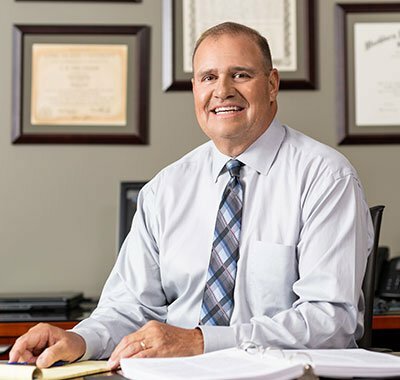 Tom has been trying criminal and civil cases since 1982, successfully defending and representing individuals facing criminal charges, driving under the influence, domestic relations cases, juvenile charges, and personal injury and wrongful death cases. After starting his career as a Johnson County, Kansas Assistant District Attorney in 1982, Tom has been in private practice since 1985 and was recently honored to be selected, through peer recognition, as a 2014 Lawyer of the Year for non white collar criminal defense, as recognized by Best Lawyers in America®. Tom’s relentless hard work and well developed trial skills have benefited numerous clients facing serious criminal charges such as homicide and felony DUI. His extensive trial practice, especially in felony and DUI defense, is bolstered by the development of new defenses and strategies applied throughout every stage of a case to combat the efforts of State and City prosecutors. Tom has lectured throughout Kansas on topics such as criminal and DUI defense, training other lawyers to defend those charged with serious criminal offenses. His unyielding pursuit of excellence has been recognized with the highest possible rating, AV*, from Martindale-Hubbell for more than ten years, an exclusive peer review rating system, reflecting the high esteem in which Tom is held throughout the legal community. Tom’s litigation style and willingness to try tough cases has served his many clients well in various practice areas. Tom enjoys working for those people who have placed their case in his hands with the confidence that he will work tirelessly to protect their interests in the midst of difficult times.